Yara Yara essential oil, prevalently known as Yarrow essential oil has a bundle of therapeutic properties that has made its presence inevitable in the world of Complementary and Alternative Medicine including the oldest natural healing system known as Ayurveda, meaning the knowledge of life. Use of Yarrow as a natural medicine dates back to more than 60 thousand years and this was proved by its presence on the body of a Neanderthal. Such a distinguished herb is used in different forms like essential oil, decoction, powder and much more in treating a series of illnesses. Yara Yara, a celebrated sacred herb was known to be used by Achilles, the Greek hero of Trojan War for healing the wounds and to curtail bleeding of his soldiers. The botanical name of this plant Achillea Millefolium is followed by his name Achilles. Historical references prove that the ancient Chinese medicinal system used Yarrow essential oil to treat problems related with menstruation whereas the primordial Scandinavians used this efficacious oil to treat rheumatism. Yarrow essential oil was used in Scotland to protect from evil and was trusted to have an all-healing potential to treat numerous disorders all through the ages. Yara Yara oil was added to certain Swedish beers and the historical uses of this herb goes on and on as a never-ending list. This herb is also known as Milfoil for its feathery look. Where does Ayurveda come into picture? Ayurveda, the knowledge of life is a holistic approach and the oldest systems of medicine in treating humanity. According to Ayurveda, any disease is an indication that your body is out of balance. Every individual is considered unique with a specific set of physical, mental and spiritual values. Ayurveda trusts that human beings are imperative part of nature and every human body is made up of the five vital elements of nature, namely air, water, ether, fire and earth. An individual’s constitution is made up of three predominant bodily humors known as doshas (Vata, pitta and kapha), which are a combination of any of these five elements of nature and it determines the personality and attributes of a person. With this belief as the fundamental principle, Ayurvedic texts indicate that the disharmony of your system with nature is the root-cause of all illnesses. The beauty of Ayurvedic healing lies in transforming the entire lifestyle of an individual into a healthy one based upon his unique constitution. Ayurveda believes that nothing better than natural remedies can cure mankind that is a part of nature containing the vital elements of nature. For this Ayurveda prescribes the use of herbs, essential oils extracted from plants, yoga, meditation and spiritual values that binds humanity with one’s Creator. Yara Yara is known as Biranjasipha in Ayurveda. With cooling properties, Yarrow and its essential oil is said to treat pitta imbalances like indigestion, fever during cold, heartburn and inflammation. In their famous book Ayurveda and Aromatherapy’, Dr. Light Miller and Bryan Miller bring out the effectiveness of essential oils for the chakras, known as the transfer points of feelings and the bodily functioning of certain endocrine glands. Light Miller says “the essential oils increase the finest and farthest vibrations and assist all of the subtle bodies. Essential oils can stigmata and assist in the process of awakening, healing, opening the chakras, and strengthening the aura.” According to her, Yara Yara essential oil is one best essential oil in stimulating the heart chakra. With its antiseptic, emollient, anti-inflammatory, haemostatic, vulnerary and antispasmodic properties, yara yara essential oil is among those best natural oils in treating numerous skin problems like cuts, burns, acne, rashes, marks, open sores, stretch marks, dermatitis, psoriasis, inflamed wounds, epileptic seizures, dryness, eczema, unshorn skin due to aging and many other. This oil stops bleeding, aids in retaining the moisture of the skin and helps significantly in the quicker formation of new skin. By stimulating the leucocytes and blood platelets in the affected region, this oil effectively checks and curbs the presence of bacteria, fungus and other microbes that worsen the wounds. Staphylococcus aureus is a harmful bacterium that causes the infection of wounds and Yara Yara essential oil with its antimicrobial effects has been proved effective against the effects of Staphylococcus species. 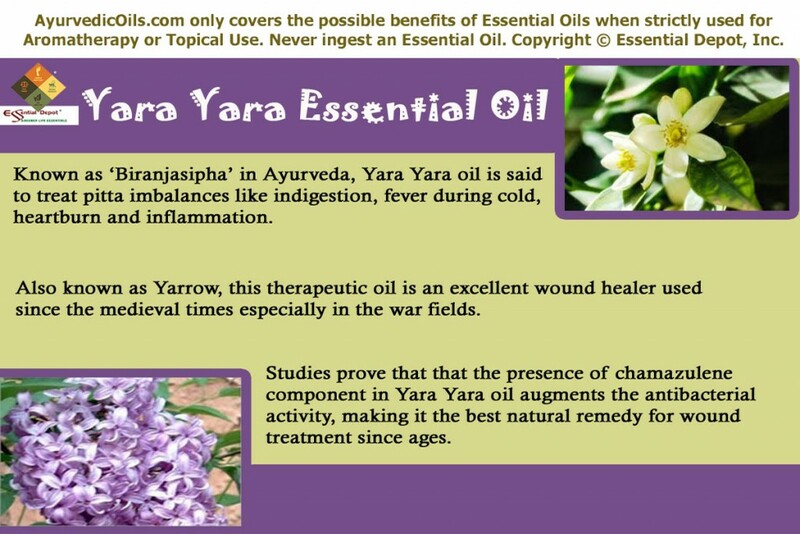 This study proved that the presence of chamazulene component in Yara Yara oil augments the antibacterial activity, making it the best natural remedy for wound treatment since ages. 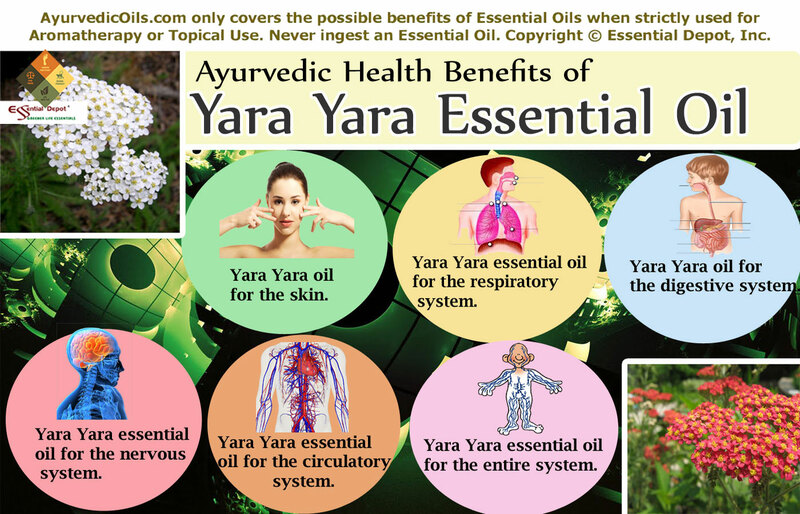 Just like the other essential oils like peppermint, eucalyptus, tea tree, rosemary and hyssop essential oils with expectorant, analgesic and decongestant properties, yara yara essential oil is also effective in treating respiratory problems like congestion, cough, bronchitis, asthma attacks, cold and controls the secretion of phlegm. Adding few drops of this oil to your chest rub can grant you great relief from all sorts of respiratory problems. A research on the ‘Antioxidant and antimicrobial activity of the essential oil and methanol extracts of Achillea millefolium subsp. millefolium Afan. (Asteraceae)’ by the Cumhuriyet University revealed that “Eucalyptol, camphor, alpha-terpineol, beta-pinene, and borneol were the principal components comprising 60.7% of the oil”. This makes Yara Yara essential oil as a promising natural remedy in treating cold, fever, cough and other respiratory disorders. Yara Yara essential oil is highly beneficial for the digestive system and supports in treating various digestive disorders like constipation, colic, indigestion, stomach cramps, bloating, loss of appetite, heaviness along with pain in the chest, flatulence, gall-bladder and intestinal pain, gastric catarrh and few other dyspeptic conditions. With its stomachic, carminative, digestive and anti-spasmodic properties, yara yara oil is said to remove and prevent gas formation in the stomach and intestines. This oil enhances the secretion of bile and other digestive juices, helping in trouble-free digestion. A recent research proved that Yarrow has been traditionally used in the treatment of spasmodic gastro-intestinal disorders, inflammation and hepato-biliary complaints. A gentle Ayurvedic massage with 2 to 3 drops of Yara Yara essential oil blended with carrier oils like Jojoba oil, almond oil or sesame oil can grant immense relief from all sorts of digestive disorders. This essential oil has hypotensive and tranquilizing properties that calms the heart and soothes the nerves. Hypertension, insomnia, high blood pressure, excess stress and brain hemorrhage can be assisted perfectly with the healing powers of Yara Yara oil. It tones up and relaxes the nervous system and boosts the immune power, making you resistant against harmful diseases. Yarrow essential oil enhances blood circulation and assists in treating hemorrhoids, varicose veins, arthritis, rheumatism, menopausal disorders, cystitis, irregular menstruation, dysmennorhea, formation of uric acid crystals in the body and few other health problems associated with the circulatory system. The anti-rheumatic, anti-inflammatory, haemostatic, emmenagogue and astringent properties of this oil makes it the ideal choice for treating problems related to improper circulation. Numerous other health benefits of using Yara Yara oil are removal of toxins from the body, control of dandruff and hair fall, promotion of hair growth, aid in treating gum problems, stimulation of the metabolic functions and hostility against infections in the excretory system and reproductive system. Susanne Fischer-Rizzi talks about numerous gynecological uses of Yara Yara essential oil and she says that this oil can be used in douches, diffusers and sitz baths. The most impressive information about Yarrow herb is its use by Hildegard of Bingen to treat breast cancer with the salve prepared with petals of yarrow flowers. She advised her patients to rub this salve on the ulcerated parts and expel the toxic things followed by the use of the ointment prepared with Yara Yara flowers to promote proper healing with its antioxidant properties. When nature can gift us with a handful of promising remedies like these, why should you turn back to the contemporary medical system for artificial healing? Think again!! Direct application of essential oils is not recommended as it may cause allergies or harms the skin; blend it with carrier oils before using it as massage oil or for any other topical application. Do not ingest essential oils or use it on babies and pregnant women without the advice of your health care expert. This entry was posted in Ayurvedic Essential Oils, Essential Oils - Learn About and Purchase and tagged Achillea Millefolium, Ayurveda and Yara Yara Oil, Ayurvedic health benefits of Yara Yara essential oil, Ayurvedic health benefits of Yarrow essential oil, Best oils for wounds, Biranjasipha, Essential oils for digestive system, essential oils for skin care, Health benefits of Biranjasipha, Health benefits of Yara Yara Oil, Health benefits of Yarrow oil, natural oils for respiratory problems, Staphylococcus aureus, Therapeutic properties of Yara Yara oil, Yara Yara essential oil for skin, Yara Yara oil, Yarrow oil by AyurvedicOils. Bookmark the permalink.